A number of coastguard control centres, which co-ordinate and manage rescue efforts across the UK, are expected to close under government spending cuts. One report suggests more than half of the 19 centres could shut. 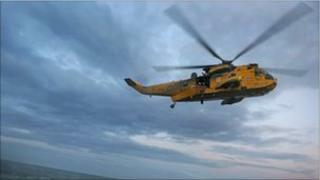 Ministers are also to press ahead with plans for a private company to take over the UK's search and rescue helicopter fleet. The Department for Transport needs to cut its spending by 15% over the next four years. The Chief Secretary to the Treasury, Danny Alexander, told BBC One's Andrew Marr Show that Transport Secretary Philip Hammond would set out details about the service over the next few days. But he said the government's key principle on this and other expected announcements was to "use our resources wisely so we reduce waste". In February it was announced that the 24-hour service would be run by private consortium Soteria from 2012, from 12 bases across the UK.